The American Institute of Architecture Students (AIAS) is proud to announce a new partnership with Rinker Materials, a QUIKRETE® Company. The two organizations have partnered to bring the AIAS membership a new competition, Pipe Dream: A Tiny Home Competition. Rinker Materials’ signature product is their concrete pipe, which can be used in many facets from storm drains and culverts to irrigation. In recent years, tiny homes have proven to be a positive solution for communities facing challenges such as population growth in urban areas, addressing homelessness, climate change and other natural disasters, and environmental degradation. Thanks to the ingenuity of Rinker Materials and design expertise of architects, tiny homes built from concrete pipe provide real-world solutions for communities who are facing challenges such as overpopulation, homelessness, and can even be used as temporary shelters for refugees facing natural disasters, environmental degradation, and political unrest. 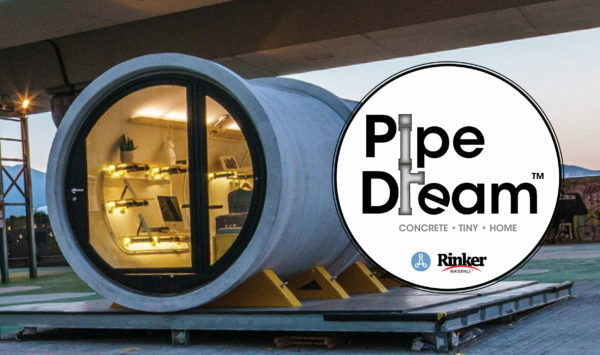 With Pipe Dream, the AIAS and Rinker Materials are looking for members to share their sketches or renderings in new and innovative ways to transform concrete pipes into tiny homes. The competition asks students to think about what constitutes ‘home’ and how that can be condensed into tiny, livable space. “The AIAS is always seeking strategic partners that can help deliver unique and creative opportunities for our architecture student members. The new partnership and competition in conjunction with Rinker Materials is a great example of the achievement of this goal. We’re thankful to Rinker for both the organizational support and the forward-thinking creativity they’ve brought to the AIAS competition portfolio. We can’t wait to see and share the results with them,” said AIAS Executive Director Nick Serfass, FAIA, CAE. In addition to the distribution of $10,000 in scholarship funds to the top three entries, the winning entry of Pipe Dream will see their design realized and showcased at the NAHB International Builders’ Show in Las Vegas, February 19-21, 2019. Visit aias.org/pipedream or click on the link below for competition details. Rinker Materials – Concrete Pipe Division, a QUIKRETE® Company is one of the nation’s largest and leading manufacturers of concrete pipe and related products. Founded in 1963, Rinker Materials is an industry leader in product innovation, technical expertise, high-quality products, safety, and customer service.